On Monday, the EC barred Mayawati and Maneka Gandhi for 48 hours, and Adityanath and Azam Khan for 72 hours from addressing any public meeting. When senior advocate C.A. Sundaram, appearing for the EC, told the court that it had acted against leaders violating the model code of conduct, the Bench headed by Chief Justice Ranjan Gogoi quipped: "So, you have woken up to take action. It seems the EC has got its power back." The CJI's repartee came on the poll panel's admission before the top court on Monday that it was almost "powerless" when it came to taking punitive measures against political leaders. The apex court also refused to consider Mayawati's plea against the EC gag order on her. The BSP chief's counsel Dushyant Dave contended that she was unable to conduct important election meetings because of the order and that she had been deprived of any remedy in the matter in view of the top court's observation on the EC order. The Bench replied if she was not happy, she could challenge the EC order with an appropriate petition before the court. 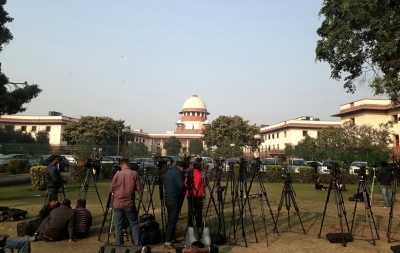 The court was hearing a plea by Sharjah-based NRI Harpreet Mansukhani highlighting the rise in hate and divisive speeches in the name of religion in this year's election campaign. The plea said such speeches were against the spirit of the Constitution.